More details from these polls are here. Intriguingly, the next wave should be due imminently. 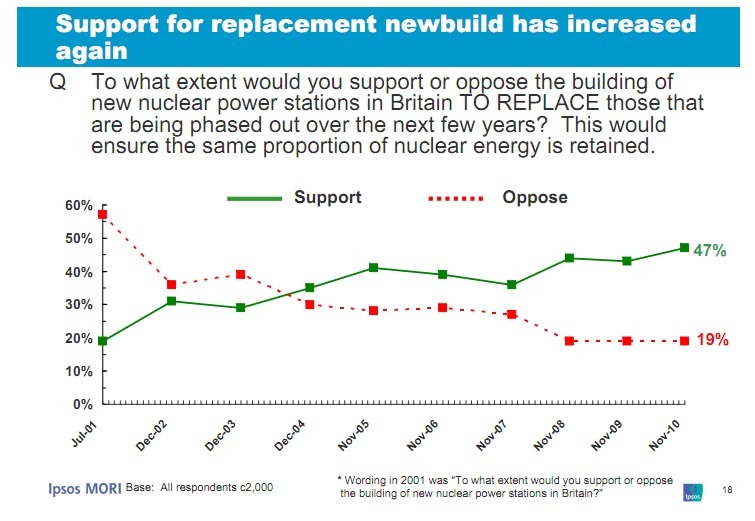 As it happens, another annual poll in the US asks an almost identical question, and finds results that are significantly more favourable to nuclear power (now 71% in favour, 26% against – but the gap was wider until recently). This was conducted by a small organisation called Bisconti Research, through (the well-regarded) polling firm GfK. The head of Bisconti has been on the Board of Directors of the American Nuclear Society, and I don’t have access to the data tables. That’s all I’m going to say about that particular tracking poll. So, in these three countries at least, there has been a clear softening of opposition up to this year. The polls now would certainly show a reversal of this, but that will be from a much higher position than it would have been a few years ago – even if the UK evidence suggests that support was lukewarm. Apologies for having only covered such a small selection of countries (and ones with similar-ish poltical and media landscapes). Do let me know if you see anything interesting from elsewhere, or come across any post-earthquake polls. And don’t forget to donate. This entry was posted on Sunday, March 13th, 2011 at 20:44	and is filed under Climate Sock, Energy sources. You can follow any responses to this entry through the RSS 2.0 feed. Both comments and pings are currently closed.